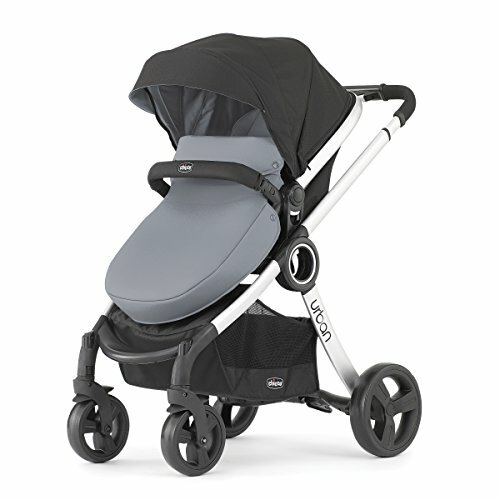 The Chico urban is a stylish, 6-in-1 modular stroller solution for your ever-changing baby. With a simple click, baby can ride in car seat, carriage or stroller - facing in towards mom or dad or out to explore the world. Key Fit carrier mode: includes click-in adapter, specifically designed to accept the no. 1-Rated Chico key fit infant car seat with an audible "click". Infant carriage mode: toddler stroller seat converts to carriage for smaller babies, with expandable canopy, soft fabric insert and removable all-weather boot. Toddler stroller mode: includes toddler stroller seat for older children with detachable arm bar, expandable canopy, soft fabric insert and removable all-weather boot. Urban also features a padded push handle with sliding height adjustment, compact fold, linked park brakes, large storage basket, and front swivel wheels. For use from birth to 50 pound swap colors with an urban color accessory kit. Featuring color-lined canopy, seat cushion and harness covers, all-weather boot and matching tote back in alternate color (sold separately).